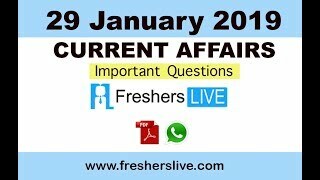 Current Affairs 29th January 2019: Instantly obtain Latest Current Affairs 29th January 2019 with all essential info, Be the first to know all the Current affairs 29th January 2019 top news, Major Issues, Current happenings, Important events in National as well as International level with clear explanation. For all competitive exams and Interviews, equip yourself with the Latest Current Affairs 29th January 2019 granted here. Home Minister N.Chinarajappa inaugurated a centralized call centre in Kakinada, Andhra Pradesh. He also launched a website (www.saukaryam.in) that were developed as part of a pilot project for the Mission for Elimination of Poverty in Municipal Areas (MEPMA) by Malireddi Charitable Trust. Mr. Chinarajappa exuded confidence that the website would become a platform for job seekers. MEPMA coordinator Srinivas and project coordinator Satya were present. Southern Railway bagged number one position for cleanliness in the country in the survey conducted by Trains Cleanliness Survey conducted by IRCTC. Last year, Southern Railways also had a hike in their gross earning of more than six thousand crore rupees.